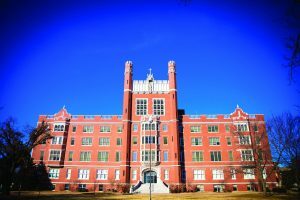 SHAWNEE—Hobby Lobby, the arts and crafts retail giant based in Oklahoma City, recently purchased the property formerly occupied by St. Gregory’s University (SGU) in Shawnee. The purchase became official Dec. 4, following bankruptcy proceedings for St. Gregory’s after the Catholic university ceased operations due to financial insolvency during December 2017. “Hobby Lobby’s interest in the former St. Gregory’s University property is to assure a meaningful, long-term future use for the property. We understand the importance of the property to the community of Shawnee, the state of Oklahoma and the vast St. Gregory’s community of alumni and former faculty. “We also recognize the significance of the St. Gregory’s Abbey community, and we’re committed to working with the Benedictine monks as they continue their important work. In the near term, Hobby Lobby’s plan is to further evaluate the condition and potential future use of each of the buildings. Several minor construction projects will be initiated in caring for the property. Hobby Lobby paid $8 million for the 73-acre property and is leasing it to OBU for a nominal amount. With more than 800 stores nationwide, the retail chain agreed in September to buy the property. A federal bankruptcy judge in Oklahoma City approved the sale in November, and the sale closed Tues., Dec. 4, when no better offers came in. Proceeds from the sale will be used to pay off claims and mortgages against the campus, a bankruptcy trustee previously told the judge. St. Gregory’s University was a private Catholic university and shared the Shawnee skyline with OBU for more than 100 years. It closed a year ago after being denied a $12.5 million loan from the U.S. Department of Agriculture. OBU has made plans to potentially utilize the classrooms and labs in Benedictine Hall for science courses. The University is also formulating plans to use the Sarkeys Performing Arts Center as another venue for presentations by its theater, choral and instrumental programs. “Oklahoma Baptist University will enter into a lease with Hobby Lobby to use the former St. Gregory’s University property as an extension of the OBU campus. This lease agreement provides the opportunity to use spaces available on the former SGU campus while Hobby Lobby determines their long-term plans for the property. “In anticipation of a possible lease, OBU administration and faculty have discussed best use for the academic space and have several plans in process, including use of the classrooms and labs in Benedictine Hall for science courses. Additional plans are being formulated including use of Sarkeys Performing Arts Center which will provide an additional venue for presentations by our theatre, choral and instrumental programs.